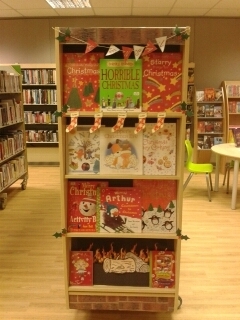 Kensal Library is looking very festive: we have our tree and snowflakes up and some wonderful winter displays for our stock (which we have had to top up several times!). A Westminster resident who came into the library commented that Kensal was lovely, bright and fresh (thanks!). Leanne Bellot, one of our Kensal CSA’s, has created a very cosy looking winter fireplace design to showcase some of our favourite festive reads. Thanks to Laryssa, one of our regulars, who helped Leanne with the display. Last Friday saw our special Winter Baby Rhyme Time party: we read some Christmas stories, sang some classics like ‘When Santa got stuck up the chimney’ and ‘Christmas Pudding’ (accompanied by noisy rattles and bells!) and had a craft session making Santa beards. All the children went home with a colouring book, a puzzle and a big smile. Our last Crochet Diva session was on Monday 16 December. The ladies who come regularly to this event really enjoy the session and the company and have produced some lovely pieces of work. For a couple of sessions they made jewellery and this proved to be very popular so watch this space for future sessions of jewellery making – perfect if you want to learn a new skill in 2014! The next Crochet Diva session will be on Monday 6 January at the usual time of 1.15 to 3.15pm. All the staff at Kensal wish our customers a Merry Christmas and a Happy New Year.